Even in a land filled with remote and beautiful canyons, Llewellyn Gulch offers outstanding scenery. 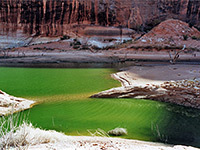 It starts as a sandy wash at the base of the 1,500 foot cliffs beneath Fiftymile Point and quickly deepens as it cuts down into the endless Navajo sandstone slickrock that extends eastwards to the shores of Lake Powell. 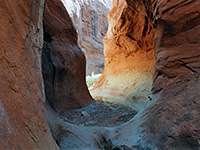 For over a mile the gulch is very narrow and twisting, with pretty, light orange-colored stone passageways that eventually widen somewhat as a clear stream begins to flow then gradually opens out into an impressive sheer, red-walled gorge that ends at the aquamarine waters of the lake. 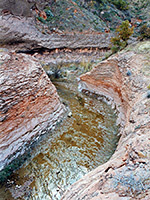 This has flooded the lower 2 miles of the canyon and provided an easier access to it - many arrive by boat and explore the lower reaches, as far as the first of several obstacles in the narrow, middle section. 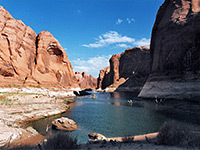 Although thought of as one of the Escalante canyons, Llewellyn Gulch flows into Lake Powell about 7 miles south of the main river and all lies within the Glen Canyon National Recreation Area. It is reached by driving 50.5 miles down the long, straight Hole-in-the-Rock road to the Davis Gulch crossing, over some sections towards the end that may occasionally require 4WD, then walking 2 miles southeast over slickrock to the canyon edge. An alternative approach is to hike south/southwest from the parking area towards the base of Fiftymile Point then follow a faint cattle path close to the base of the Fiftymile Bench cliffs and descend one of two forks of the upper canyon. 23 views of Llewellyn Gulch. 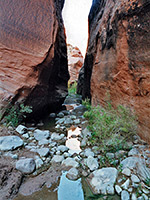 The gulch starts in the trailless fantasy land of undulating red domes and ravines south of Fiftymile Point - the two branches begin amongst the boulder-strewn terraces underneath the cliffs and join after 1 mile from which the ever-deepening gorge extends 3 miles further to Lake Powell. The north branch has some short narrow passageways, minor drop-offs and a few troublesome chokestones then a steep fall of about 20 feet that is not free-climbable, so the south fork is preferred. This is reached after another 20 minutes walk south along the livestock path and is marked by some cattle troughs next to a small spring. The wash here is V-shaped but downstream soon becomes more canyon-like, with a few shallow narrow passages then drops 10 feet or so beyond a chokestone and shortly after has a longer drop over a near-vertical pour-off. This can be climbed but ropes are advised. 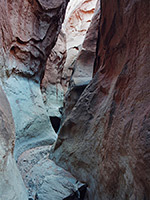 Below here is a stretch of deep narrows which in wet weather has extensive pools and patches of deep, sticky mud but was completely dry on this visit. These two obstacles can be bypassed if required by climbing up the south side just before the first drop and descending back down not far ahead. 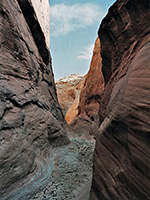 The canyon then has a long section of attractive narrow passageways occasionally only 1 metre across but mostly rather wider. The floor is sometimes flat and sandy, in other places bare rock often covered by many small boulders. There are several climb-out routes on both sides including the north fork canyon that joins after about 20 minutes walking and seems quite shallow at this point. There is one other significant obstruction - a dry fall of 15 feet which can quite easily be climbed and is followed not far after by the last possible entry/exit point for a while, on the south side. Footprints increase a lot after here, left by people walking up from the lake. The gulch begins to widen, and at one point has an unusual split channel for a few hundred yards, about half way along the gulch - it is around here that a gentle stream starts to flow, and soon the canyon floor is filled with reeds and cottonwood trees. After a few more bends the canyon is markedly deeper and wider with large sandbanks at either side, through which the now quite fast moving stream flows along a small channel that cuts through many thin strata. A well-worn path snakes up and down the grassy banks and reaches the lake after a walk of 90 minutes from the spring. This location is very scenic and beautiful; quite often visited judging from the number of footprints yet without any litter, the lake has shining, greenish water punctuated by stark dead tree branches, bleached pure white by the sun while above rise the towering vertical walls - a magical scene. Parts of the shoreline have sheer cliffs while others have nice beaches but there are also some patches of quicksand. An alternative way back is to leave the main gorge by the start of the stream, where a side canyon joins from the north - the cliffs on the left side offer a route to the plateau above. 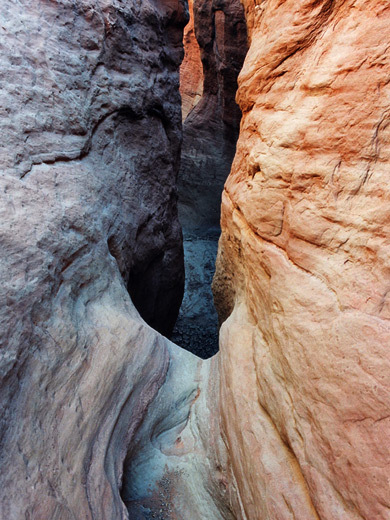 The canyon itself can't be used as it ends in a very narrow vertical pour-off. Using Fiftymile Point as a guide, the starting point for the hike is reached again after about one hour walking across the slickrock.